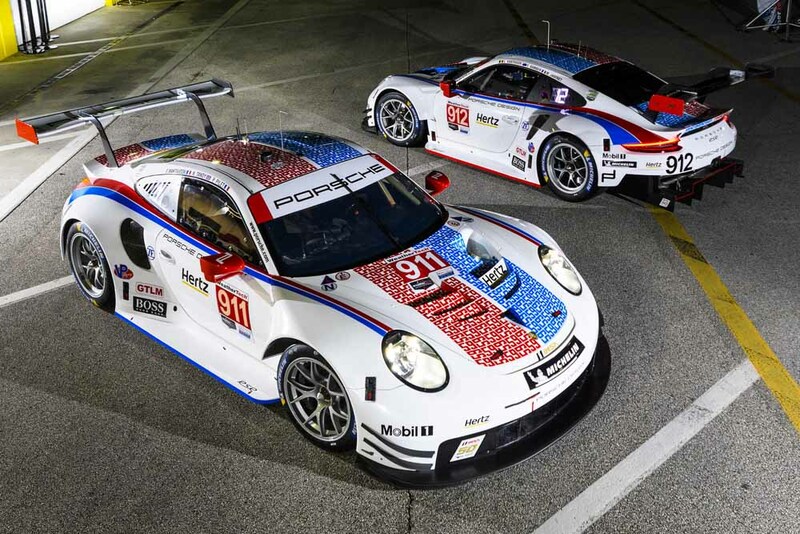 The Porsche GT Team sends its two 911 RSR to contest this year’s 24 Hours of Daytona and 12 Hours of Sebring sporting a legendary design: The ca. 510-hp sports cars from Weissach will fly the colours of the successful Brumos team at the two longest races of the season. The squad from Jacksonville (USA) was active in the North American motor racing scene for over five decades. Claiming four overall victories at the Daytona endurance classic makes Brumos one of the most successful teams in the history of the race. For Porsche, adopting traditional vehicle designs last year was unfailingly linked with wins. The Porsche 911 RSR tackled the 24 Hours of Le Mans in the famous “Pink Pig” livery, with the sister car making the one-two result perfect in the “Rothmans” colours. At the season finale of the 2018 IMSA SportsCar Championship at Road Atlanta, the 911 RSR drove to victory in the iconic factory design of the Porsche GT1 from 1998.